Eight concentric circles contain phrases in small writing. The circles are surrounded by a lot of text, filling up most of the space within the square frame enclosing the circular shape. Above the circle are two eyes looking upwards, separated by a symbol. A pair of footprints can be seen on the left, towards the bottom, in the middle of text. Decorative emblems are at the four corners of the square. All the writing and symbols on the cloth are in red ink. This is a sūri-mantra-paṭa – a type of yantra or mystical diagram – found among Śvetāmbara monastic orders. The magic and sacred syllable hrīṃ is at the top, in the middle, with an auspicious eye each side. The circles are similar to the depiction of continents and oceans in Jain cosmology while the writing in each one consists of lines of mantras written in Sanskrit or Prakrit. assorted classes of demons, such as preta and piśāca. Dispersed around the yantra are a few Sanskrit stanzas, which pay homage to deities, such as the one to Śrīdevī in the bottom-left part. In the middle of the right-hand side is a Prakrit stanza honouring Pārśvanātha or Lord Pārśva, the 23rd Jina. One phrase appears in several places on the yantra, referring to asmad-gaccha – ‘our gaccha’. The gaccha or sect is not named but the heads of the Kharatara-gaccha monastic order are listed in the top corners, making it clear that the yantra refers to this sect. The list begins in the top left with the monk who is said to have founded the sect in the 11th century, Vardhamāna-sūri, who died in 1031 CE, and the monk who consolidated this order, Jineśvara-sūri. There are several heads of the Kharatara-gaccha with the name Jinacandra-sūri. But it is likely that the footprints and homage refer to the one listed in the top right, who is one of the Dādā-gurus. These are the major teachers of this monastic order, who largely owe their fame to their miraculous powers (see Babb 1996). Corresponding to 1449 CE, this date makes this sūri-mantra-paṭa one of the oldest surviving examples, if it is authentic. However, the name of the ārādhaka is missing, who is the person who would have worshipped this yantra. The absence of a name indicates that perhaps this mystical diagram was never used. At the very bottom of the lower-right corner is a label that was not written by the scribe who created the yantra. The word ṭebā is a variant of ṭabo, a Gujarati word that means 'commentary' or 'word-to-word paraphrase', while ro is the Rajasthani postposition meaning 'of'. The date is strange but is probably meant to be (1)506, repeating the original date in the Vikrama era. It is likely that the label was written in the 19th century, when many Jain mantras and maṇḍalas changed hands, to identify the object. 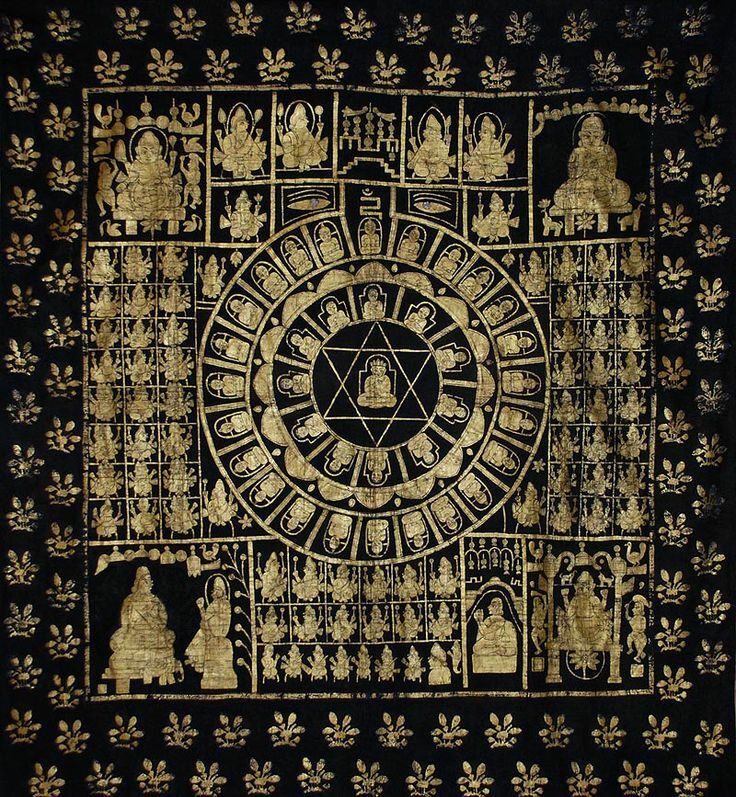 A sūri-mantra-paṭa is a mystical diagram on cloth, like here, or on paper, which features formulas of homage and sacred syllables – mantras. It is thus a kind of maṇḍala or yantra, which is frequently used in worship and meditation among both ascetics and lay people. Monks of the Śvetāmbara monastic orders use sūri-mantra-paṭas when they reach the higher ranks of religious hierarchy. The yantra gets its name from the highest grade of male mendicant, which is sūri, but it can also be used among lower monastic levels. More generally, worshippers are inspired by the example of Indrabhūti Gautama or Gautama-svāmin, the foremost disciple of Mahāvīra, the 24th Jina. He is often shown at the centre of the diagram, although not here. The date on this sūri-mantra-paṭa corresponds to 1449 CE, making it among the oldest known examples. All yantras include pictures and text but the muted colour scheme and chiefly textual appearance of this one contrasts sharply with modern sūri-mantra-paṭas, which are often brightly coloured and have little text. An image of a contemporary Br̥had Sūrimantra Paṭa on Flickr. This maṇḍala is used in rituals of worship, specifically by the highest-ranking monks in the various Śvetāmbara Mūrti-pūjak orders. This example is mainly made up of colourful illustrations, with auspicious symbols, mantras and figures surrounding Indrabhūti Gautama, in the centre. As the lead disciple of Mahāvīra, Gautama is the role model of the perfect ascetic leader. An ornate sūri-mantra-paṭa on the Flickr website. A large golden figure of Indrabhūti Gautama, head disciple of Mahāvīra, takes the lotus position in the centre, flanked by worshippers. Rows of deities and worshippers honour him while sacred syllables and the 24 Jinas form rings around him. This sacred object is used for ritual and meditation by Śvetāmbara Mūrti-pūjak monks, primarily those from the Kharatara-gaccha and Tapā-gaccha. Only top-ranking monks can use it, aiming to imitate Gautama and to harness the power of the maṇḍala. This striking gold-and-black sūri-mantra-paṭa presents Indrabhūti Gautama in the middle. He sits within two triangles positioned within concentric circles, surrounded by holy figures and scenes of worship. Gautauma was the head disciple of the 24th Jina, Mahāvīra, and his spirituality and leadership provide an example to which monks aspire. Such yantras are used by leaders of Śvetāmbara Mūrti-pūjak mendicant orders, with the Kharatara-gaccha in particular ascribing great powers to these ritual objects. A circular sūri-mantra-paṭa on the HereNow4U website. This modern paṭa on a tomato-red background has at its centre an image of Indrabhūti Gautama, head disciple of Mahāvīra, who is being worshipped by lay men. The 24 Jinas and other holy figures sit in concentric circles, separated by a ring of mantras. A pair of auspicious eyes, the hrīṃ mantra and the sun and moon sit above the paṭa. An avatar of Viṣṇu, the preserver or protector who is one of the three major Hindu gods. Rāma is a prince of Ayodhyā and is often shown with blue skin, holding a bow and arrow. The epic poem Rāmāyaṇa recounts his adventures as he searches for his wife Sītā, who has been kidnapped by Rāvaṇa. Blending Jain values into the story, the Jain Rāmāyaṇas cast him and other figures in the tale as some of the 'great men' of Jain Universal History . (1075–1154) Kharatara-gaccha monk. Later biographers give accounts of his miraculous powers, including raising the dead. He is one of the four Dada-sūris or Dada-gurus – 'granddad gurus' – of the Kharatara-gaccha , who are worshipped in western India.